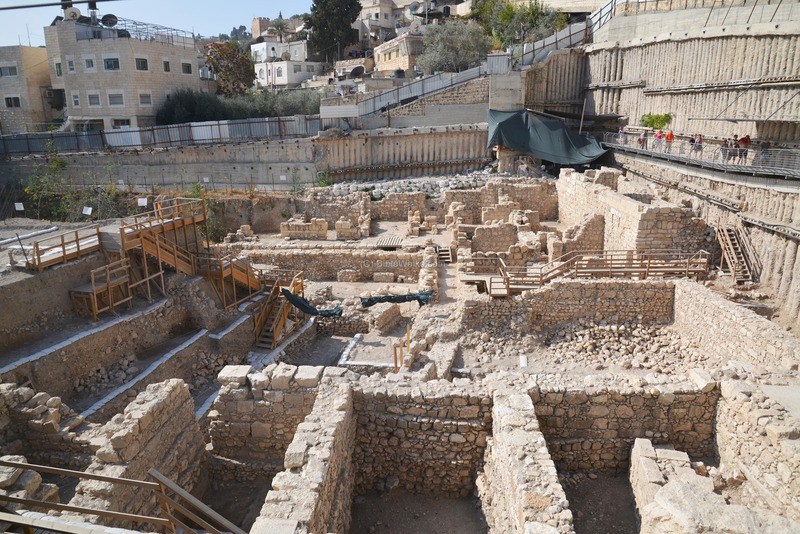 One of the most exciting excavation areas, conducted in the area of the City of David. 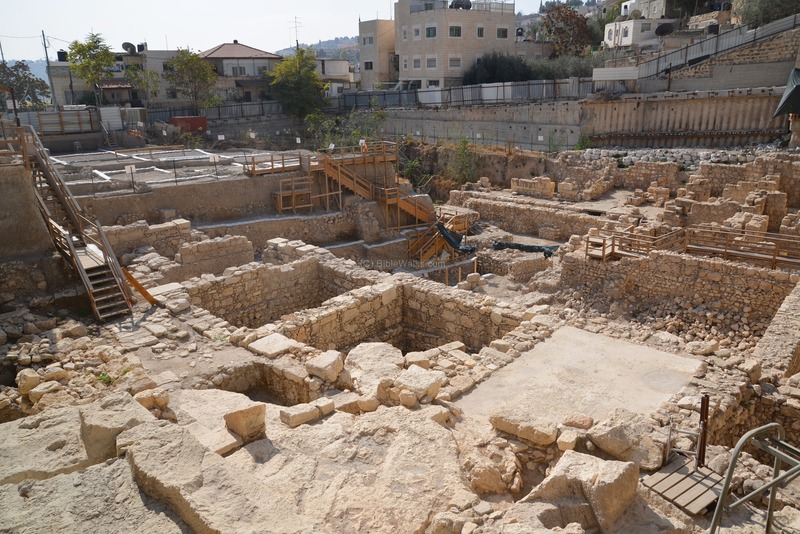 Extensive excavations are conducted since 2007 in the Giv'ati car park, an area south of the Dung gate and adjacent to the entrance of the City of David archaeological park. The site includes findings from different layers of the city, spanning periods from the Iron Age to the Middle ages. The excavation site is located south of the Dung gate, 30m from the Ottoman walls, covering an area of 3500 square meters. The location of this area, and other sites in the area of the "City of David", are shown in this aerial view. Clicking on a yellow square will jump to the selected point in this page or other web pages. After the Persians defeated the Babylonians (539BC), and King Cyrus "the Great" allowed the Judean exiles to return back to Israel (Zion) and rebuild their temple in Jerusalem (516 B.C.). Herod the Great, King of Israel under the Romans (37BC - 4BC), enlarged and rebuilt the second temple, and made it a magnificent temple. 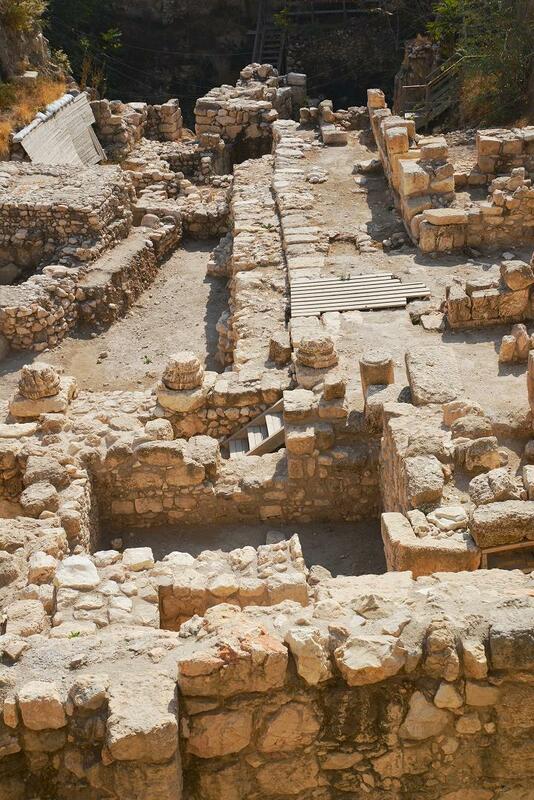 Herod reshaped the city, constructing public houses, streets, bridges, tunnels, and fortifications. An illustration of Jerusalem at the end of the 1st Century B.C. and the beginning of the 1st Century A.D., is shown here with the city's major points of interest. 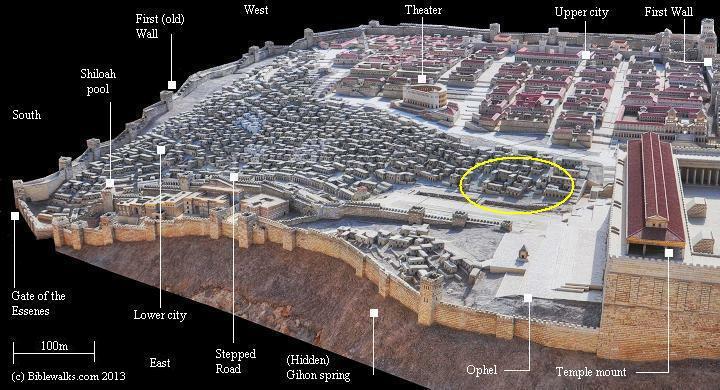 The general area of the excavations, south of the temple mount, is marked as a yellow ellipse. 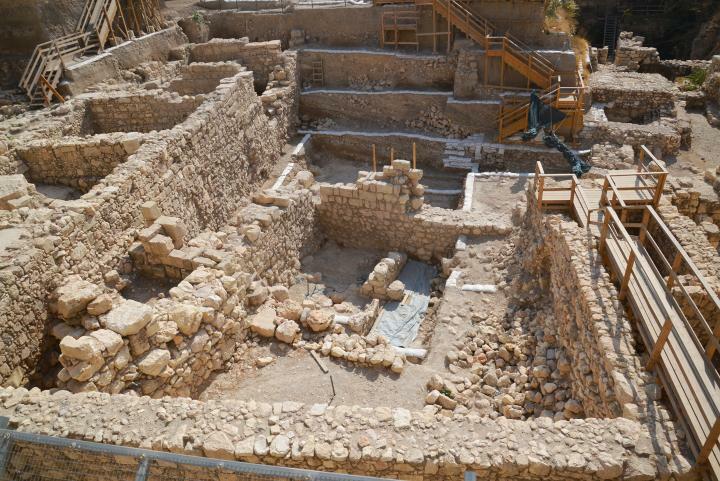 The findings included structures from the different periods, starting from the Iron age and the Hasmonean period. The temple, and many parts of the city, were destroyed by the Romans in 70 A.D. Evidence of the destruction were found in this excavation. During the late Roman and Byzantine periods the area was rebuilt as part of the Aelia Capitolina city. Excavations in the area of the current excavations were carried out in the past 90 years: Macalister & Duncan (1923–1925) to the east of the area, J. Crowfoot and G. Fitzgerald (1927-1928) 100m south of the area, and Kathleen Kenyon (1961–1967) northeast of the area. Eli Shukron and Ronnie Reich (IAA), assisted by El'ad Association, conducted a trial excavation from May to December 2003. This was followed with several seasons of excavations, directed by Dr. Ben Ami and Yana Tchekhanovets. 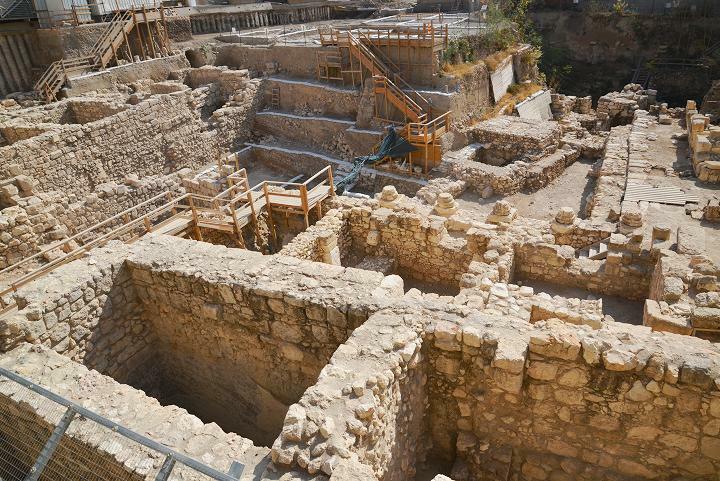 The excavation site is adjacent to the City of David archaeological park, and is accessed from a gate facing the entrance to the park. After completing the excavations, the area is going to be converted into a new visitors center for the City of David archaeological park. A general view of the excavations, as seen from the entrance on the east side, is seen here. The tall concrete walls, built to reinforce the deep cavity, were constructed along its sides. Beyond the wall, on the right side, is the road along the old city walls. The buildings in the background are part of the western section of the village of Silwan. Behind the green cloth cover, on the right side, is an exit from the central drainage canal, an underground water channel dated to the second temple period. The next photo is viewed towards the south. Notice the number of layers of excavated structures, where older layers are generally located in deeper levels. A view from the north-west corner of the area is shown below. The entrance to the City of David archaeological park is located behind the fence. The following sections are arranged in the order of the periods, starting from the Iron Age. Four layers dating to the Iron age were discovered in Givati parking lot, dating from the 9th-8th Century up to the 6th-7th Century B.C. The earliest findings in this excavation site were built on the bedrock. The structures were densely built houses of poor condition, with single stone wide walls. Above this layer was a layer of ruins dated to the 7th and 6th Century B.C. The discovery of a Hasmonean period structure was announced on the eve of Hanukah (IAA Dec 2013). The structure is seen here on in the northeast side of the excavation, at the bottom layer. The headlines of the report was: "In recent months remains of an impressive building from the Hasmonean period (second century BCE) are being unearthed in excavations the Israel Antiquities Authority is directing in the Giv‘ati parking lot, located in the City of David in the Walls Around Jerusalem National Park. 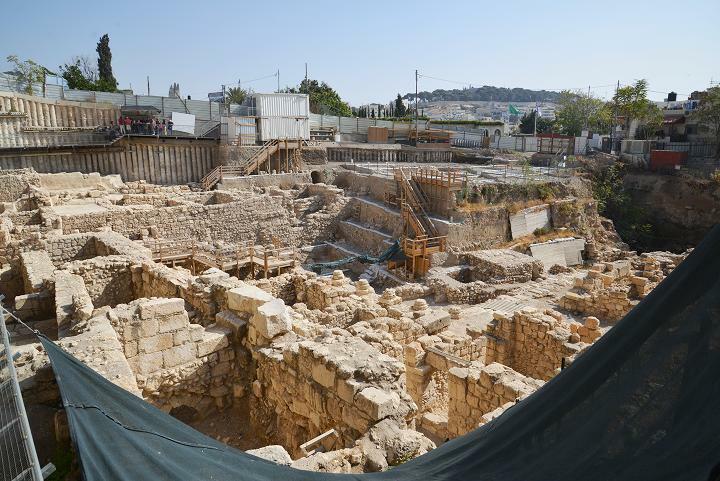 The excavations are sponsored by the "Friends of City of David". "The building stands c. 4 meters high and covers an area of c. 64 sq. m. The building’s broad walls (more than one meter thick) are made of roughly hewn limestone blocks that were arranged as headers and stretchers, a construction method characteristic of the Hasmonean period. Although numerous pottery vessels were discovered inside the building, it was mainly the coins that surprised the researchers. These indicated the structure was erected in the early second century BCE and continued into the Hasmonean period, during which time significant changes were made inside it. According to Dr. Doron Ben Ami and Yana Tchekhanovets, the excavation directors on behalf to the Israel Antiquities Authority, “The importance of this discovery is primarily because of the conspicuous paucity of buildings from the Hasmonean city of Jerusalem in archaeological research, despite the many excavations that have been conducted to date. 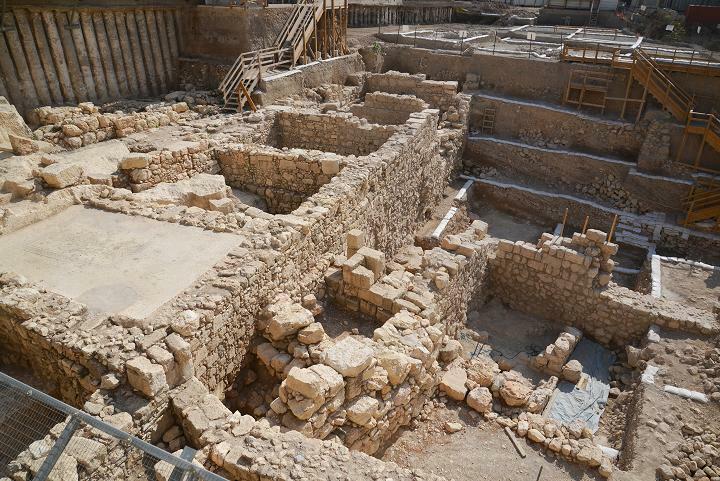 Apart from several remains of the city’s fortifications that were discovered in different parts of Jerusalem, as well as pottery and other small finds, none of the Hasmonean city’s buildings have been uncovered so far, and this discovery bridges a certain gap in Jerusalem’s settlement sequence. The Hasmonean city, which is well-known to us from the historical descriptions that appear in the works of Josephus, has suddenly acquired tangible expression”. 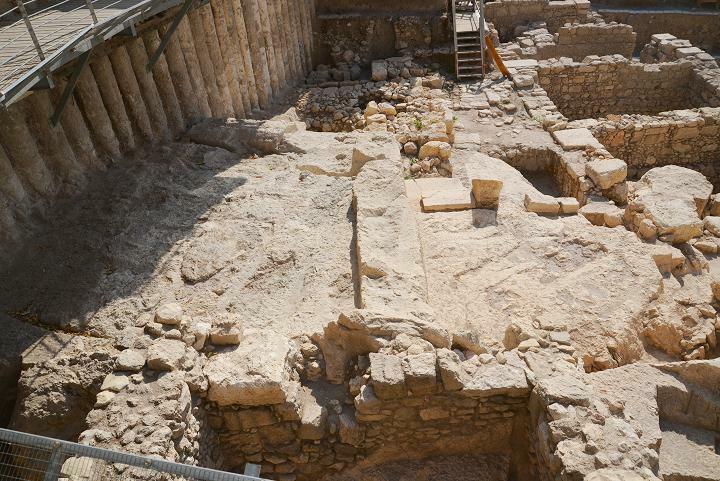 A structure dated to the second temple period were discovered on the south side of the excavation, directly below the complex of the Roman/Byzantine level. This was a building of impressive dimensions, and may have been a part of the palace of Queen Helene of Adiabene. Its walls rise to a height of more than 5 meters and were approximately 2 meters wide. It has a basement level was built of vaults made of neatly dressed white ashlars stones. The walls were plastered and decorated with colorful frescoes. In the northern section of the structure, several water systems were found, including two ritual baths (miqveh). This ritual bath, seen from the north side, has steps descending from the west side. The pool was cut into the ground, but now hewn in the bedrock. A nearby square cistern supplied the water to the ritual baths. A plastered bath was also found near the miqveh. "Evidence of the drama which transpired within it prior to its destruction by the Romans in the year 70 CE can be seen in the narrow openings that were discovered in the basement level through which its inhabitants attempted to flee. Much of the structure was intentionally demolished at that time: the stones from the walls and the ceilings of the upper stories were discovered mixed inside the destruction layer that accumulated on the floor of the basement. Among the finds recovered are pottery vessels, stone vessels and coins that date to the end of the Second Temple period. The exposure of the remains of such a spacious building as this raises the question regarding its function and identification. 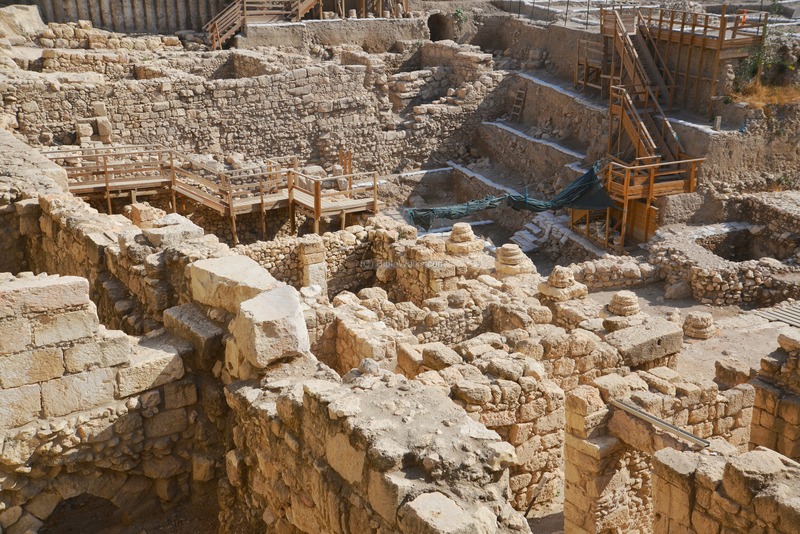 According to the excavation director, Dr. Doron Ben-Ami of the Antiquities Authority, the structure, which is an anomaly in the landscape of the Lower City at the end of the Second Temple period, is probably connected to the buildings which the royal family of Adiabene erected there according to the testimony of Josephus. Nonetheless, he notes, “this interpretation of the finds should not be accepted without due reservation and the hope that upon expanding the excavation in coming seasons we will discover finds that will aid in identifying the architectural complex”. ". More than a hundred years after the destruction of Jerusalem, the Romans constructed a large mansion, which covered most of the excavated area. The complex extended to the north (right), which is now covered by the road along the south side of the old city walls. The Roman mansion covered an estimated area of 1,000 square meters in the area which is visible, and probably another similar size buried under the road on the north side. This large complex was built in the Roman period (3rd Century), and had a plan of a number of rooms located around a large open courtyard. According to the IAA report (Aug 2009): "“Although we do not have the complete dimensions of the structure, we can cautiously estimate that the building covered an area of approximately 1,000 square meters. In the center of it was a large open courtyard surrounded by columns. Galleries were spread out between the rows of columns and the rooms that flanked the courtyard. The wings of the building rose to a height of two stories and were covered with tile roofs.". This photo shows the south side of the mansion, with remains of the surrounding columns, which held the roofed structures (porticoes) that surrounded the courtyard. 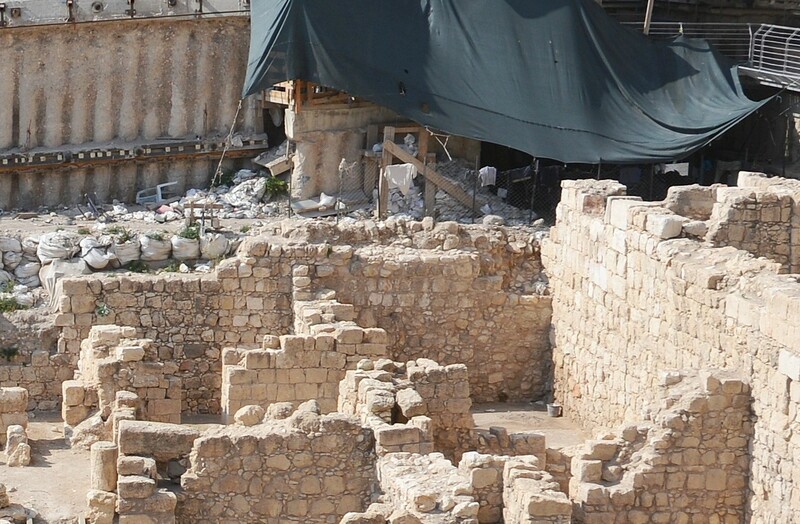 Note that in the area behind, on a lower level, are the remains of the earlier second temple period structure. The mosaic floor, seen in the next photo, with details on the right side, decorated one of the rooms on the second story of the Roman mansion. "A large quantity of fresco fragments was discovered in the collapsed ruins from which the excavators deduced that some of the walls of the rooms were treated with plaster and decorated with colorful paintings. The painted designs that adorned the plastered walls consisted mostly of geometric and floral motifs. Its architectural richness, plan and particularly the artifacts that were discovered among its ruins bear witness to the unequivocal Roman character of the building. 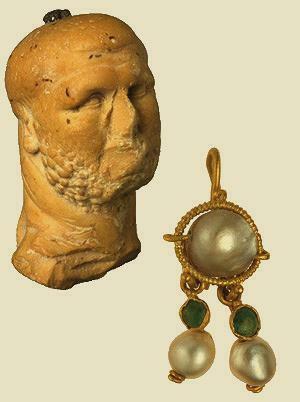 The most outstanding of these finds are a marble figurine in the image of a boxer and a gold earring inlaid with precious stones". "The building, which was constructed during the third century CE, was shaken by a tremor in the fourth century, the results of which are clearly apparently in the excavation area: the walls of the rooms caved-in and their stone collapse, which was piled high, covered the walls of the bottom floor, some of which still stand to a considerable height. Architectural elements such as columns and capitals, as well as mosaics and the large amount of fresco fragments that were used in the rooms of the second story were discovered inside the collapsed ruins. The coins that were discovered among the collapse and on the floors indicated the building’s ruins should be dated to circa 360 CE. It seems that what we have here is archaeological evidence of the results of the earthquake that struck our region in 363 CE. 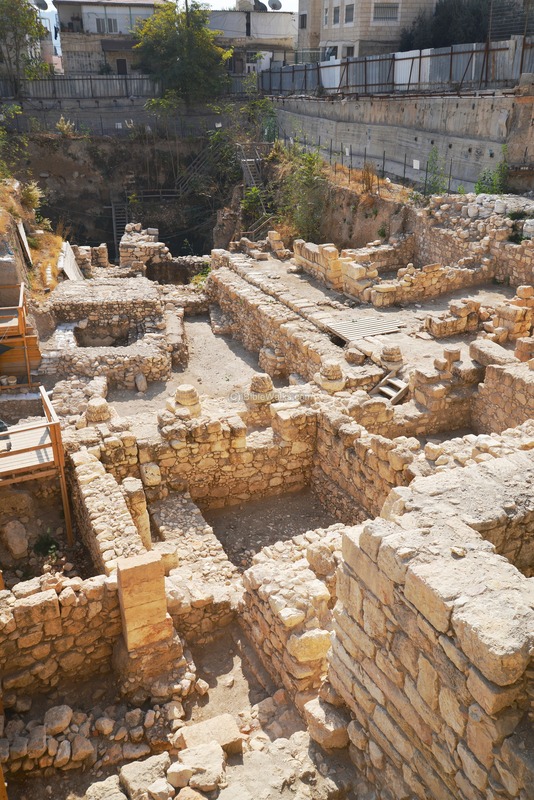 Dr. Ben-Ami adds, “We know of no other buildings from the Roman period that were discovered in Israel which have a similar plan to that of the building from the City of David. The closest contemporary parallels to this structure are located in sites of the second-fourth century CE that were excavated in Syria. Edifices such as these are “urban mansions” from the Roman period that were discovered in Antioch, Apamea and Palmyra. If this parallel is correct, then in spite of its size and opulence, it seems that this building was used originally as a private residence”. 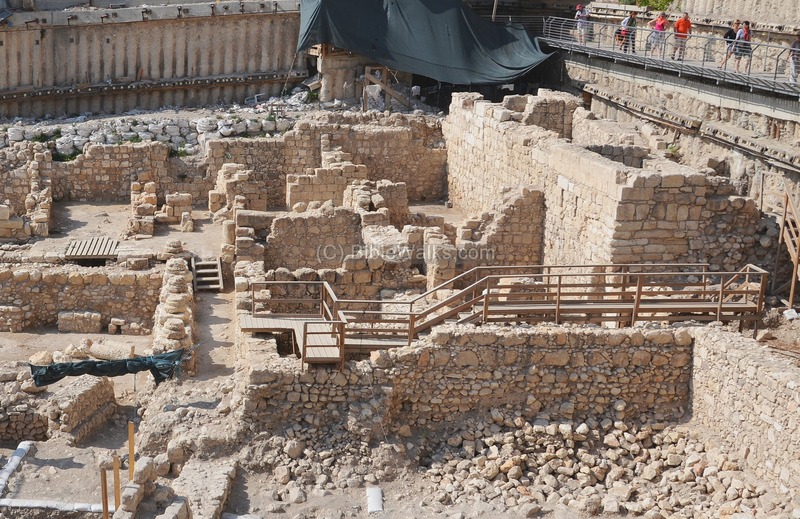 Dr. Ben Ami summarized: "The exposure of the Roman building in the City of David is a significant contribution to our understanding of the extent of the construction in the Roman city in the third-fourth centuries CE. It constitutes extremely important archaeological evidence regarding the growth of the settlement at the end of the Roman period into the southern precincts of the city, and it shows that the prevailing supposition among scholars according to which the City of David hill remained outside the area of Roman settlement at the time of the Aelia Capitolina is no longer valid". The Roman mansion collapsed in the middle of the 4th Century. A.D. (the Byzantine period), following the major earthquake on May 18/19 363 which caused damages in the Galilee and some damages in Jerusalem. Its second floor crashed down on the first floor. Rather than repairing the damage, the remains of the house were covered with a high level of garden soil, a meter or more, on its south side. The Byzantine builders then planted an orchard in this garden, and reused some of the Roman period stones to construct the terrace walls. The view below is from the north side of the mansion. The orchard was located in a courtyard beyond the wall. Below its soil is the older level of the Roman structure. An illustration of the site at the Byzantine period is shown here on the right. The complex was probably the residential place of a high ranking official in the Byzantine administration. The northwest side of the mansion was adjacent to the wide (6m) road, which descended from the temple area to the south area of the Shiloah pool. 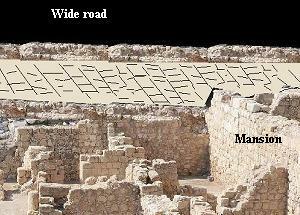 A section of 30m of the paved road were found above the wall, as illustrated here on the right. A drainage channel connected the room to the channel under the road. Another section of the road were excavated 100m to the south by the archaeologists J. Crowfoot and G. Fitzgerald (1927-1928). The next photo shows an arch inside the wall of the lower floor of the Byzantine mansion. The mansion had at least two floors. 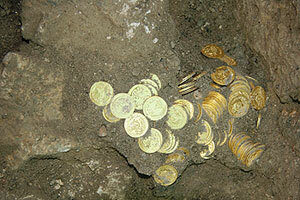 An impressive hoard of gold coins were found inside one of the rooms, dated to the 7th Century. 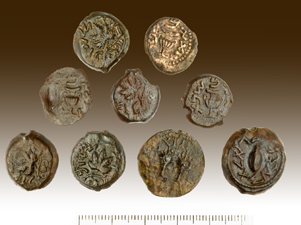 According to the IAA report (Dec 2008): "This is one of the largest and most impressive coin hoards ever discovered in Jerusalem – certainly the largest and most important of its period”. 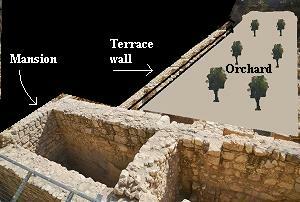 Dr. Ben Ami added: "Since no pottery vessel was discovered adjacent to the hoard, we can assume that it was concealed inside a hidden niche in one of the walls of the building. It seems that with its collapse, the coins piled up there among the building debris”. 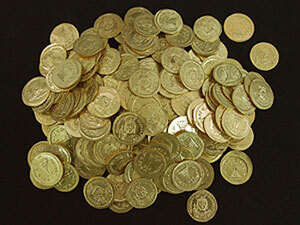 As for the description of the coins: "For comparison’s sake, it should be noted that the only hoard of gold coins from the Byzantine period that has been discovered to date in Jerusalem consisted of only five gold coins. All of the coins bear the likeness of the emperor Heraclius (610-641 CE). Different coins were minted during this emperor’s reign; however, all of the coins that were discovered in the City of David in Jerusalem belong to one well-known type in which the likeness of the emperor wearing military garb and holding a cross in his right hand is depicted on the obverse, while the sign of the cross is on the reverse. These coins were minted at the beginning of Heraclius’ reign (between the years 610-613 CE), one year before the Persians conquered Byzantine Jerusalem (614 CE)". These mint, unused gold coins suggests a dating for the destruction of the Byzantine mansion, which occurred probably during the Persian conquest (614). The walls were toppled and the rubble filled up the rooms, thus ending the Byzantine chapter in the history of the city. 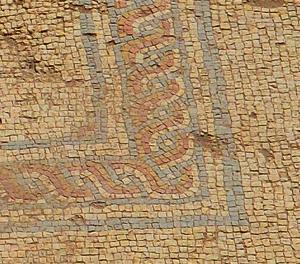 Remains of the Early Islamic period were discovered above the Byzantine period level. 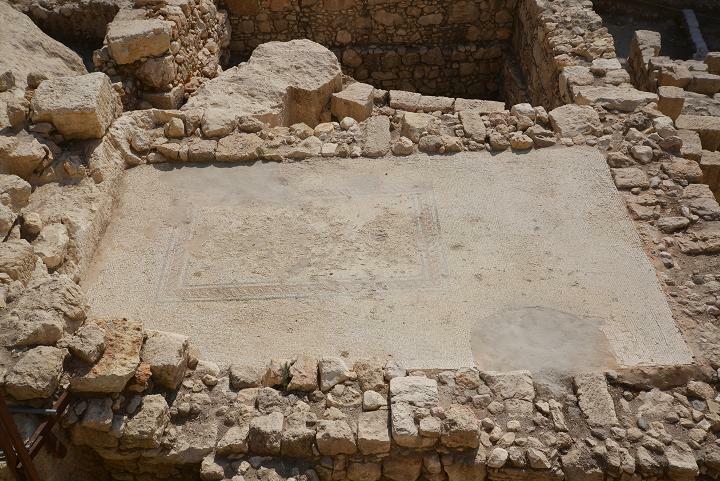 One of the findings included a Hebrew inscription on a marble slab bearing the name Bar Yaakov, perhaps belonging to the Jewish residential quarter which was established after the end of the Byzantine period. (IAA Oct 2011): "The box, which dates to the Byzantine period (sixth-seventh centuries CE), is adorned on the inside with the drawings of two figures (icons) surrounded by a background lined with gold leaf, and it seems that the artifact was used as a personal prayer relic. The box is 2.2 cm long by 1.6 cm wide and is made of a bone taken from a large animal (steer, camel or horse). The box slides open. When doing so it includes two flat parts, each of which bears a colored drawing. 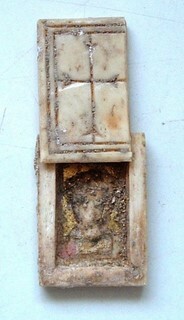 According to Yana Tchekhanovets, director of the excavation together with Dr. Doron Ben-Ami of the Israel Antiquities Authority, “The use of icons (cultic objects portraying sacred figures) for prayer outside the church is a phenomenon known in the Christian world already in the fifth century CE. However, the painted holy relics that date to the Byzantine period which were discovered here, in the Holy Land, are extremely rare, thus making this an exceptionally important discovery. Folding icons for personal use are known to this day in modern Christendom, especially in the East. The box was discovered intact, apart from a small crack, and the fact that it was hermetically sealed ensured the preservation of the drawings on the relic’s inner panels”. The image of a bearded man against a gold background is portrayed in the drawing at the bottom of the box. His face was only partially preserved, although it is possible to discern its general shape, the dark shade of his hair and his left eye. The details of his garment can be identified, which include a white cloak with a pink spot located on its right shoulder – almost certainly a white tunic and purple stripes. The preservation of the drawing on the inside of the box’s lid was even more fragmentary. From the remaining details it is possible to reconstruct the shape of a smaller figure, probably a female, draped in a blue garment, against a gold background. The face of the figure was not preserved; however, we can discern the lines of hair (or a head scarf? ), chin, neck and part of the left shoulder. In the absence of a mechanism for suspending the relic, we can assume that the tiny object was preserved in a small cloth bag. In sealed caves that were excavated in Moshchevaya Balka, in the northern Caucus in Russia, small cloth bags such as this were preserved intact, among other things, which were found on the bodies of the deceased. Based on the context in which they were discovered it was determined that men carried them on a belt around their waist and women wore them on the upper part of their dress. According to Tchekhanovets, “Because of the poor state of preservation of the drawings in the box any attempt at identifying the figures would almost certainly be within the realm of conjecture. There are several possibilities that can be suggested: if we assume that the drawings depicted are those of a man and women the obvious possibility then is Jesus and Mary. However, in the sixth and seventh centuries CE (the date of the box) the number of saints venerated by the Christian church increased to many hundreds, two of which are probably portrayed in the drawings here". "“the tablet was discovered in one of the rooms of an enormous building from the Roman period, which was excavated at the site in recent years. 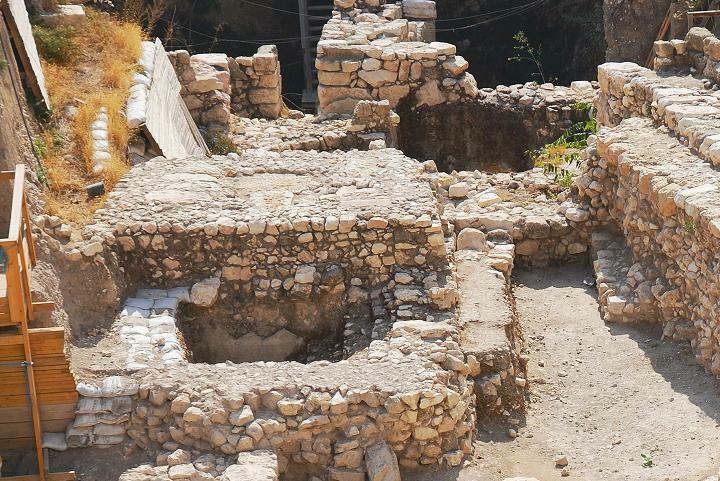 The building, which was constructed during the third century CE at the northern end of the City of David spur, was destroyed in the earthquake that struck the region in 363 CE, as evidenced by the many coins found amongst the collapse of its second story. A wealth of artifacts from this period was recovered from inside the ruins that were excavated in the building’s northeastern corner. Besides the lead tablet, the finds include a large amount of roof tiles stamped with the impression of the Tenth Legion that was garrisoned in the city following its destruction in 70 CE, bone and ivory objects, ceramic figurines and other finds attesting to the rich material culture of the structure’s inhabitants. Fresco remains found in the collapse are evidence of the second story walls decorated with painted floral and geometric patterns. The lead tablet, which at the time of its discovery resembled a small narrow pipe, was sent to the laboratories of the Israel Antiquities Authority in order to be opened. After many days of toiling, Lena Kupershmidt, an IAA conservator, was the first person to set eyes on the ancient script since it was rolled up some 1,700 years ago. She needed much patience and nerves of steel to open the lead tablet because any attempt to do so quickly might have caused permanent damage to the inscription. 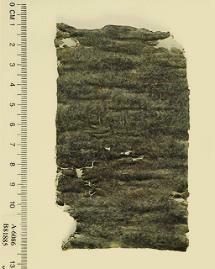 When the tablet was finally unrolled it turned out it was in an excellent state of preservation, and included a Greek inscription that covers the entire surface of one side of the tablet, as well as part of the other side. The tablet was sent for analysis and deciphering to Dr. Robert Daniel of the University of Cologne, Germany, a world renowned expert in the field. According to Dr. Daniel the text was written in cursive script and it was obviously not created by Kyrilla herself, rather by a professional sorcerer hired by her. The inscription invokes the curse a woman named Kyrilla wants cast on a man by the name of Iennys, probably in the wake of some legal dispute, the nature of is unclear. To this end she calls upon the help of the gods of the underworld, among them Pluto, Hermes Persephone, and even the Mesopotamian goddess Ereshkigal is asked to assist. “I strike and strike down and nail down the tongue, the eyes, the wrath, the ire, the anger, the procrastination, the opposition of Iennys” – so says Kyrilla in one portion of the curse tablet. What we have here might be a metaphorical description of actions taken by Kyrilla designed to gain control over her legal opponent. At the same time we cannot rule out the possibility that writing the text on the tablet was literally accompanied by Kyrilla striking the image (?) of Iennys with a hammer and nails in a kind of ancient voodoo ritual. Kyrilla hid the tablet in a place associated with Iennys and therefore the second floor room inside the ruins where the tablet was discovered was probably his residence. Alternately, a courtroom might have been situated in this corner of the Roman building where the trial of Kyrilla and Iennys was conducted. Kyrilla evidently concealed the object shortly before the structure was destroyed in the earthquake, after which the building was abandoned and never reinhabited". Dung Gate parking - The Giva'ti Car park is also known by this name.